Polex Environmental Engineering presents their range of particulate scrubbers, which are specifically designed to filter contaminated air. 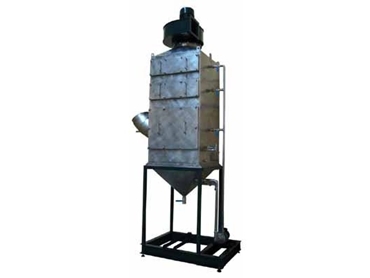 The particulate scrubbers are ideal for filtering food powders, brick dust, metal grinding and explosive dusts. The air first enters the particulate scrubber through a 90 degree bend and is intercepted by an array of water droplets. The Venturi plate accelerates the air and increases the number of collisions with the water droplets. The particulate scrubbers are manufactured from fully welded stainless steel sheet metal construction with the standard grade of 304.2B. Depending on the dust type, the stainless steel 316.2B is used for additional corrosion protection. For more information on Polex Environmental Engineering and their range of industrial air pollution control equipment, visit their website.